There has been a huge increase in anti-Muslim incidents in France following the Islamist attacks in Paris two weeks ago. At 116 confrontations this month, it’s more than double the amount recorded for the whole of January, 2014. The National Observatory Against Islamophobia said over one hundred incidents have been reported to the police since the terrorist attacks of January 7-9. Three French Islamists killed 17 people during their shooting spree. The human rights group says there have been 28 attacks on places of worship and 88 threats have been made, as reported by AFP. The rise in attacks over the last two weeks represents an increase of 110 percent over the whole of January 2014, the organization said on Monday. Observatory president, Abdullah Zekri, has condemned "acts of hatred towards French people of the Muslim faith, the immense majority of whom respect the values of the Republic and secularism." He added that "this situation is unacceptable and we're asking the authorities to go beyond the reassuring speeches and act to put an end to this scourge,” he said, as cited by AFP. There is a growing fear of reprisals amongst Muslims in France, who have an estimated 3.5-5 million followers. Mourad Ben Azizi, a French national of Tunisian origin, wondered, “how Muslims will go on living normally in a country where they are believed to be behind all the violence and attacks in France," as reported by the Xinhua news agency. "Today, we feel more and more a feeling of increased Islamophobia that is taking hold and this worries us. There have been more and more places of worship being attacked. Muslim girls and women who wear the veil or those who don't are being attacked and there's silence from the politicians," Bechari said, as reported by AP. On January 16, a Moroccan man was killed in his home in the south of France in a race related attack. The attacker confronted Mohamed El Makouli shouting, “I am your god, I am your Islam,” before repeatedly stabbing him, according to AFP. French President Francois Hollande, who has seen a surge in his approval ratings for his handling of the terrorist attacks, said in a speech last week: “Muslims are the main victims of terrorism.” He was quick to say that not all Muslims should be labeled with the same Islamist brush. 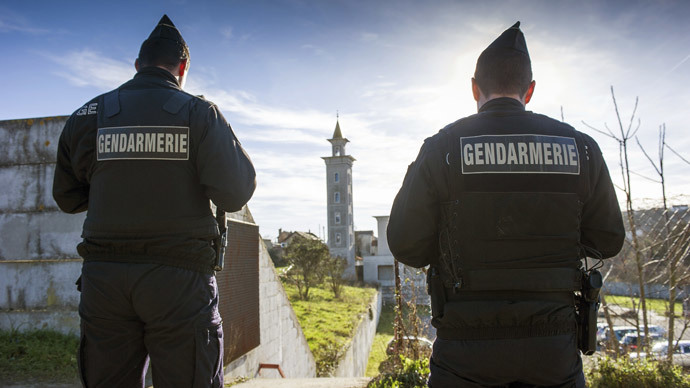 In a bid to alleviate the fears of Muslims and Jews, 10,000 troops have been stationed across the country, with a portion assigned to protect mosques in France. The leader of the far-right National Front party, Marine Le Pen, has been critical of the French government for its failure to tackle the problem of Islamic fundamentalism. In an opinion piece for the New York Times, Le Pen said, “It does our Muslim compatriots no favors to fuel suspicions and leave things unspoken. Islamist terrorism is a cancer on Islam, and Muslims themselves must fight it at our side.” The piece was published on Sunday. There has been continued debate of the word ‘Islamist’ in France, with Le Pen critical of the French government for not using this term to describe the Muslim attackers. However, Foreign Minister Laurent Fabius, who was specifically, singled out by Le Pen for criticism, said, “I don’t want to play the role of censor, but I think the word Islamist … is not the right one to use. I call them terrorists. Because as soon as you use the word Islam, you are promoting an idea of continuity between a Muslim – who practices his religion, which is a religion of peace – and something which is an interpretation of the Muslim religion,” AFP reported.